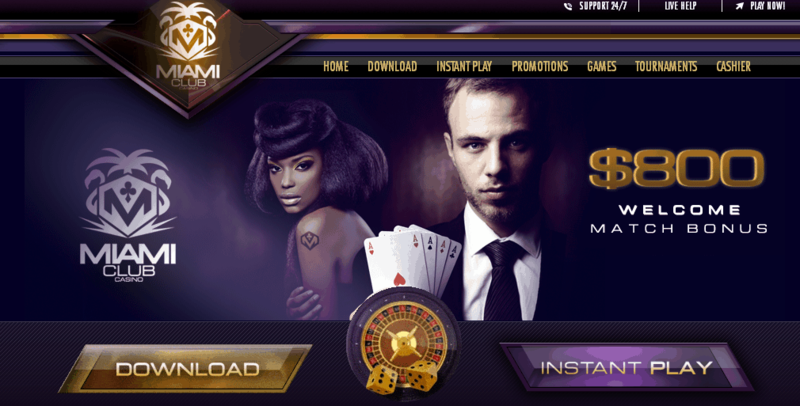 Miami Club Casino has been online since 2012 and forms part of the Deckmedia N.V. Casino Group. Miami Club Casino has been online since 2012 and forms part of the Deckmedia N.V. Casino Group. The group is very well-known among online casinos due to their level of professionalism, service, and gaming platforms. Miami Club is one of their earlier online casinos that has managed to also create a respectable name for itself by practicing the same values that made the group famous and for sure is among best USA casinos. The casino only provides the WGS gaming platform, meaning around 150 titles are offered with which players can enjoy 3D slots, table games, Video Poker, and much more. The developer is somewhat limited in some ways, including live dealer and mobile gaming. However, when it comes to other features such as security, fairness, and support, Miami Club Casino has always impressed. Members have the option to download their software for the full game selection, access the favorites on Flash, or play the latest games via mobile on smartphones. Miami Club has ensured their promotions are of the very best for their players. The massive welcome bonus comes first, which is impressive all by itself, but with the club bonuses and loyalty program included, you’ll find the casino has created a promotion platform that’s simply irresistible. To get the ball rolling, the casino has created a package that gives you extra cash for the first eight deposits made. The promotion doubles your cash up to $100 eight times in a row, meaning up to $800 can be claimed as a new player. Also, they have also added low wager requirements for this bonus, which is only 20x for the deposit value and your bonus. Players need to deposit at least $20 to activate this bonus that will provide an additional $20 in bonus funds. The casino has also made it easy to see the contribution values for the wager requirements on their terms and conditions page. Their Miami Club VIP program provides all the other bonuses you can think of. This includes reload bonuses, weekly promotions, and exclusive promotions. There are six levels available in this program, which simply requires you to earn comp points by playing their games. The higher your level is, the more points you’ll earn as well. This makes it easier to achieve the highest level and earn the very best rewards. Be sure to visit their comp points page to see how many points you can earn with each game selection and with each level. These points can also be exchanged for other exclusive offers and bonuses. Miami Club Casino has had a rather uneventful history as only one developer is featured on their site. This means the only new additions to the casino have been new games, a few additional features, and winnings. However, this is not necessarily a bad indication as they have chosen to perfect their gaming opportunities for players by focusing their promotions and features on the gaming platform offered. The casino has definitely managed to provide the very best in gaming when it comes to WGS promotions and additional features. As for their reputation, Miami Club Casino has ensured their book remains spotless. This means any issues with payments, casino features, games, and anything else is resolved promptly with professionalism being a top priority. This combined with their other features and services has earned the casino a rating above average among their players, making it worth recommending for those of you who enjoy video slots and the other games on offer while also having access to huge promotions, support, and other features. Miami Club Casino features an impressive gaming selection for those of you interested in video slots. However, as briefly mentioned above, their mobile gaming selection is limited as WGS has not enabled all their games for Miami Club Mobile. Only their most popular and latest games can be accessed on smartphones, but players will find the developer is also working on adding other titles as well. At the moment, only video slots are accessible. Live dealer software is not available whatsoever as WGS does not provide these game options. This means those of you interested in real table games will find only virtual games can be accessed at the casino along with video poker, scratch cards, and many other games. Miami Club has added all the right services to ensure their members are always taken care of in regards to getting assistance with games, accounts, or anything else at the casino. The support team is available 24 hours a day and can be reached via email or live chat on any of their pages. Live chat tends to be the most popular but to send documents for payment the better option is to do so via email. The casino is managed by a well-respected group that has obtained a license from Miami Club by the Gaming Commission of Curacao. This is one of the best licenses available for online casinos as players have learned that they require strict rules and regulations that are tested regularly. This includes game fairness, casino security, support, professionalism, and much more. Their games have to be tested by an independent third party company to ensure accuracy. Miami Club Casino is purely for players who are interested in playing video slots. There are many games to choose from, and their promotions are perfect for video slots, scratch cards, table games, and everything else they provide.